The Christie administration has not been kind to the state Department of Transportation’s Transit Village program. 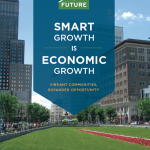 (New Jersey Future has closely followed the program’s funding battles.) After scaling back the program from an annual budget of $3 million to $1 million last year, the governor removed all funding for the program for the fiscal year that began July 1. The Legislature tried to restore funding through a provision in the budget bill that directed DOT Commissioner Jim Simpson to dedicate $1 million to the program from already allocated funds, but that effort was thwarted by the governor’s line-item veto. Commissioner Simpson has asserted that municipalities could pursue funding for their transit villages through other avenues, such as the department’s Local Aid program, but with towns having difficulty scraping together enough money to meet some of their most basic transportation needs, it is far likelier that Local Aid dollars will be used to fix potholes than to launch or implement Transit Village initiatives. Whether the DOT is ready to walk the walk — by actually providing Transit Villages with those “increased funding and grant opportunities” noted by the commissioner — remains to be seen. In the meantime, it is certainly encouraging to hear both Jim Simpson and Jim Weinstein talk the talk about fighting sprawl, protecting the environment, reducing dependency on the automobile and connecting where people live and where they work through transit-oriented development.